Act one, scene one, speech of roses. A noby decoration, initially designed for being a table adornment, but successfully could be also gift for an elegant woman. 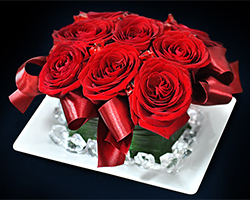 Red roses may say: “I love you”; “Take care” oraz “Thank you”. It is up to you.